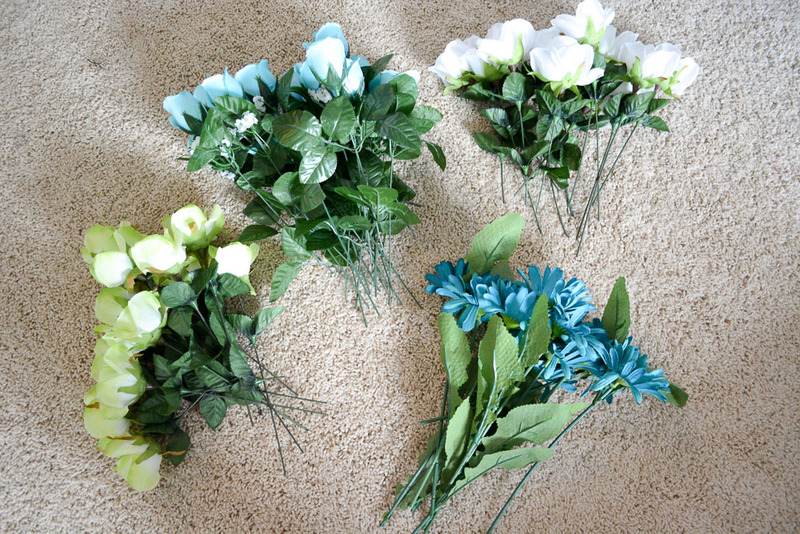 Start by cutting your flowers off the bouquets to make them individuals. They have wire stems so it is easiest to use wire cutters. I used my handy dandy needle nose pliers with the cutter in the center and it worked just fine. Try to cut them as close to the end (where all the stems gather) as possible. Then separate the flowers by color for organization. This is how many bouquets I got. I didn’t end up using the top middle flower but this was the only photo I had of the bouquets still together. 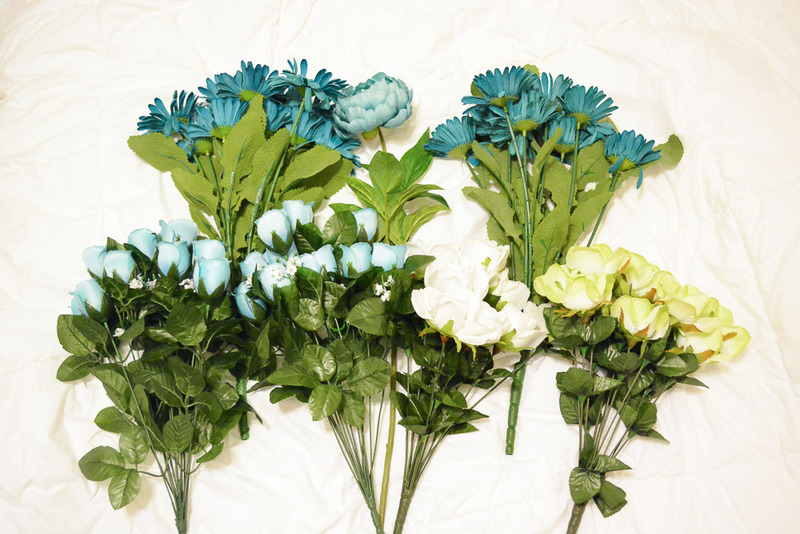 Here are the bouquets after being cut into single flowers and organized by color. 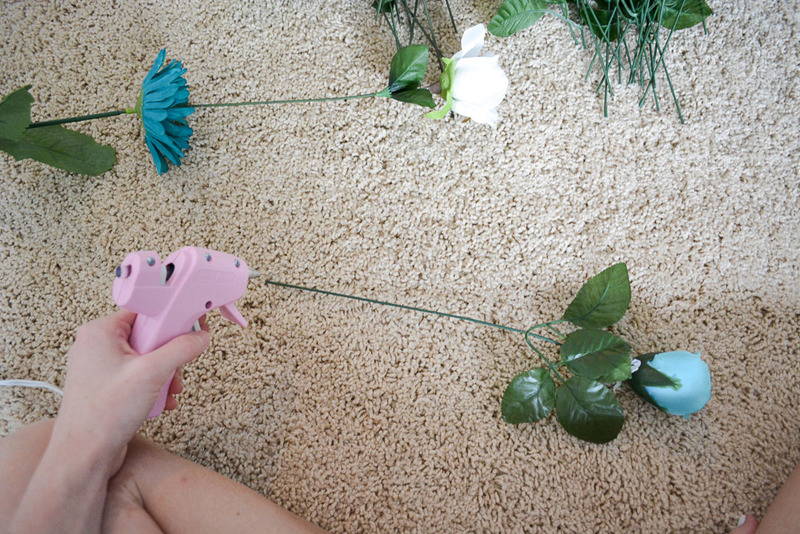 Using your glue gun, put a dab of glue on the tip of the stem of a flower and then place that stem in the center petals of the flower you want to glue it to. 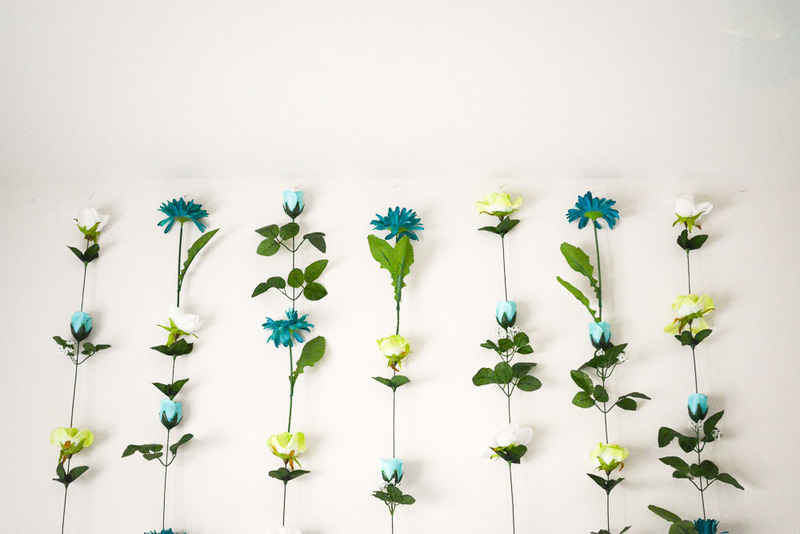 If you have flowers like my teal ones that have the shape of sunflowers, you will need to glue some petals around the stem of the flower on top of it so that it stays together. If you glue it to just the center part, it will fall apart later on. I just mixed different color combinations so that no two strands were the same. I used about 8 or 9 flowers on each strand. 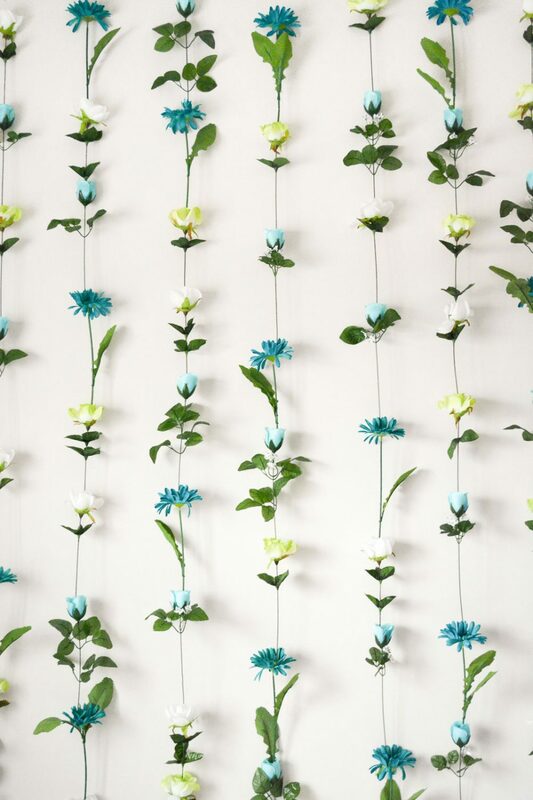 You can make your flower strands longer or shorter depending on your wall and where you are putting them. For width, I made 7 strands and placed them so that they would be the width of my queen bed. 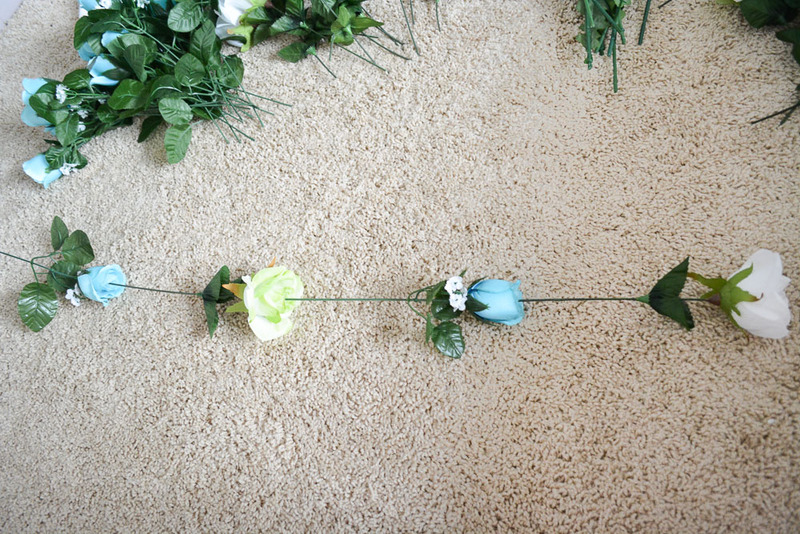 Once you have your flower strands made, you can hang them by tying a loop around the top flower head with fishing line. Then place a small nail or push pin into your wall near the ceiling and hang the fishing line on it. 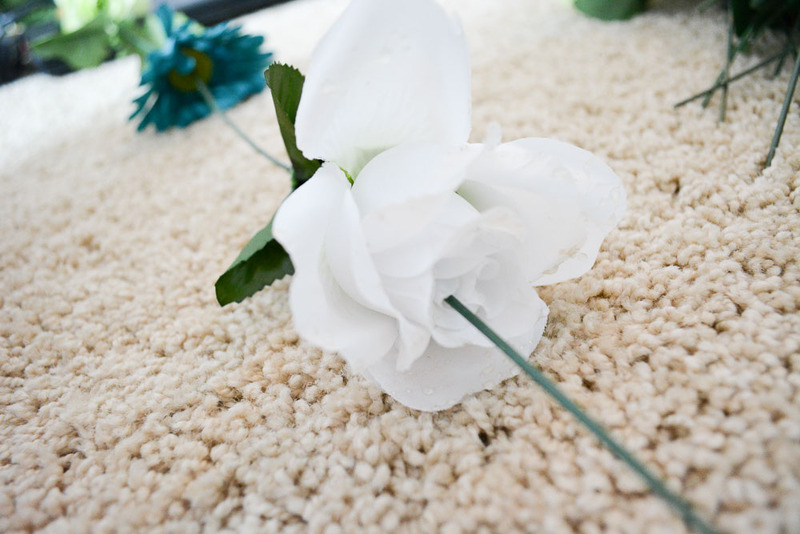 It is hard to notice the nail and fishing line and it will look like your flowers are just floating there. 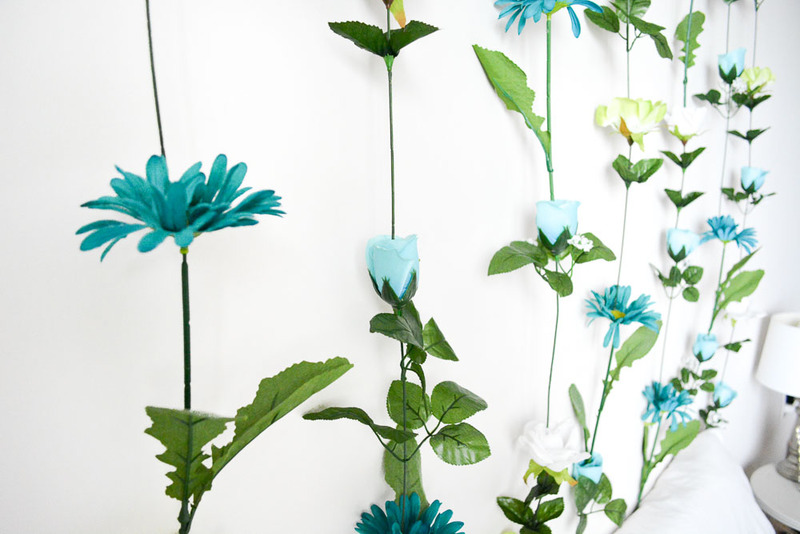 To secure my flowers even more, I just added a piece of tape that matched my wall color on the very bottom stem at the bottom of the strand and taped it to the wall. It’s not necessary but I liked the way it kept the flowers in one place. With my pillows in front, you can’t even see the tape. 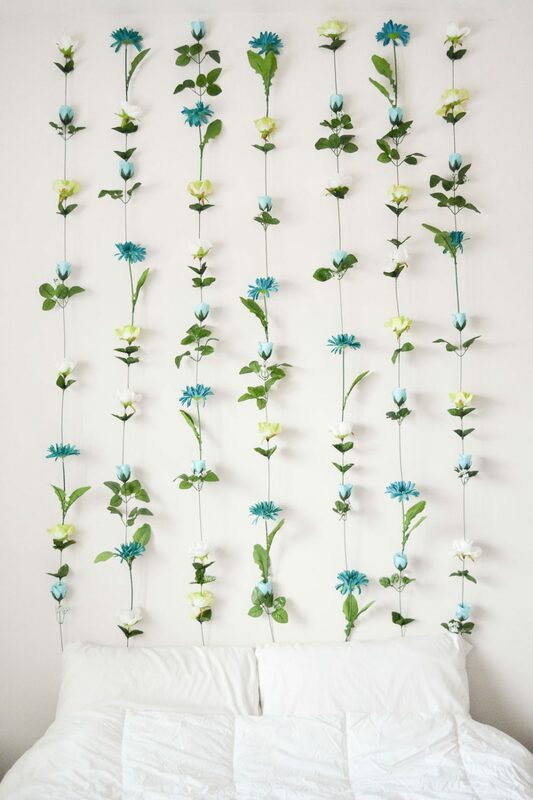 This is a creative way to make a “headboard” or spruce up a wall. To see other headboards I’ve made you can click here or here. And of course if you recreate this DIY, tag me in it on Twitter or Instagram (@sweettealblog) or include #SweetTealDIY so I can see! I think it was around $40/$50, the main cost was the fake flowers. 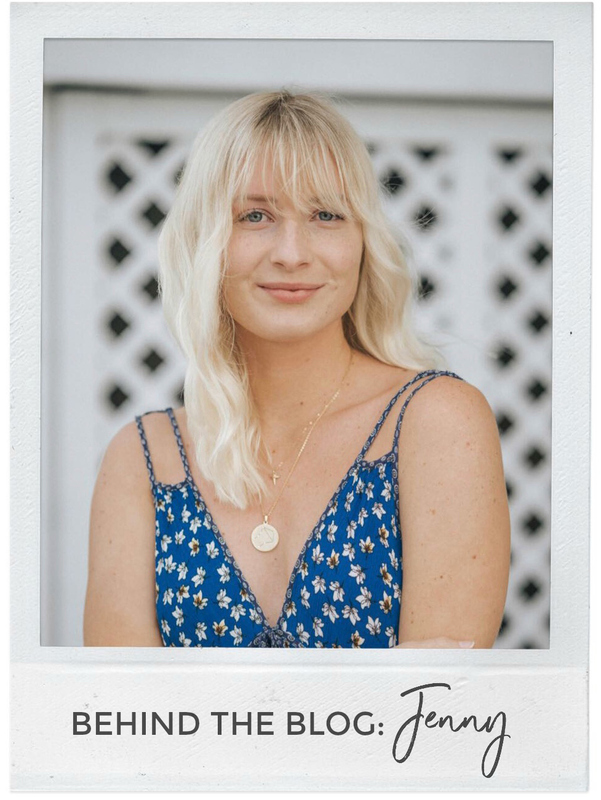 In the process of doing this – love your blog! 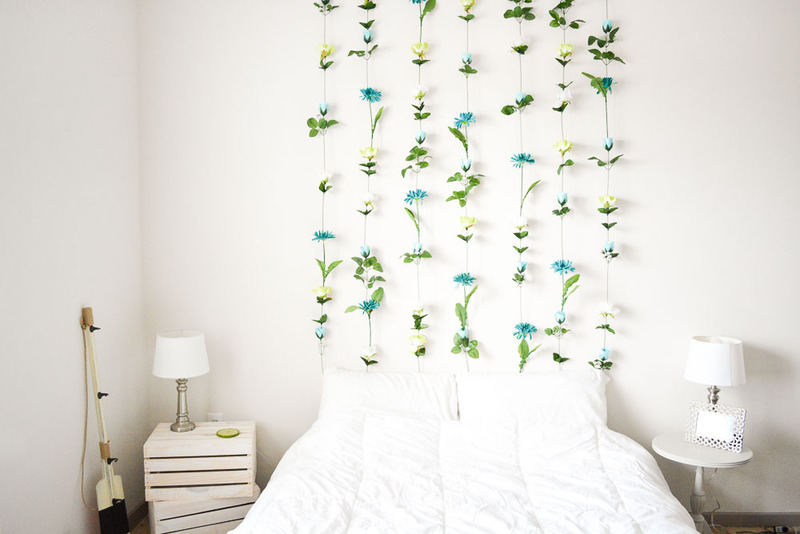 I would really love to do this for my dorm, except I’m not allowed to put pushpins in the walls 🙁 is there any other way to get them to hold? You could use Command hooks! Get them here: http://amzn.to/2vZh2pg. The clear ones would probably be the least noticeable. The flowers you used look mostly like roses? is this true? So glad you love it! Send me a picture of it once you finish it or tag me on Insta, I’d love to see! I entirely loved the decoration. It’s prefect for the spring season. From where did you get these flowers. Thanks for this lovely post. Can you please suggest me something. Recently I’ve got the interior of my entire house. Reds, strong blues and vibrant greens in particular. Please suggest me the best Area Rug, as I have a wooden Dining table in my dining room with vintage cutlery set and blue color painted walls, Suggest me something which goes absolute fabulous with this combination. 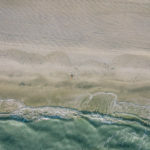 I’ve been purchasing the rugs from https://www.therugmall.com/living-room-rugs-best-rugs-to-buy-in-usa/ they have the great collection of rugs. I made this last night! Just like the picture 🙂 thank you! 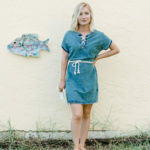 Any Joann Fabrics, Hobby Lobby, Michael’s, Dollar Store, or even Amazon.com have them! How does the fishing line work I’m so lost! 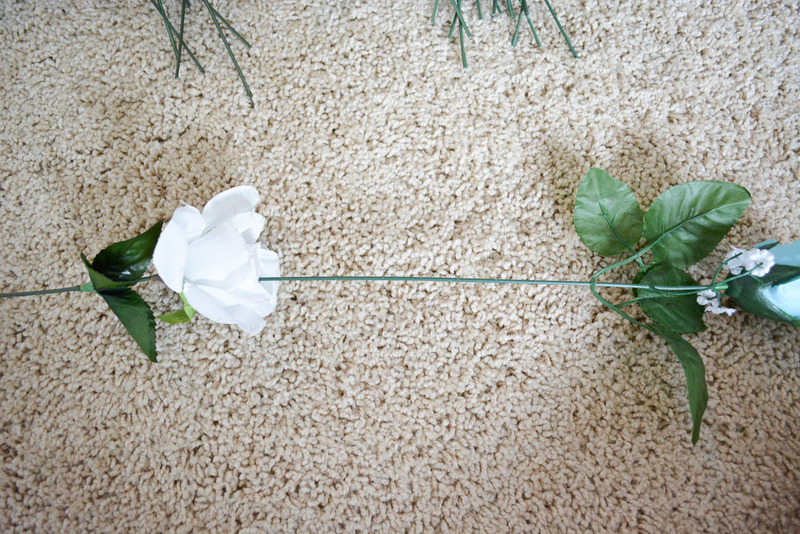 Just tie a piece of fishing line or any type of string (I used fishing line because it is clear and hard to notice) around the top flower head of each line. You’ll make a loop at the other end of the line/string and hook it on a nail near the ceiling. 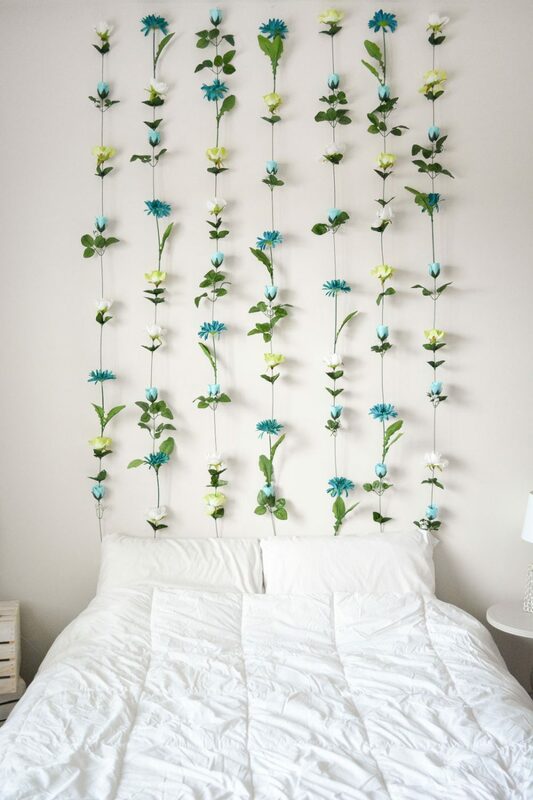 It’s how you get the lines of flowers to hang! Does that make sense? 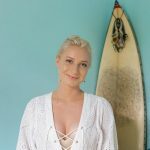 I love this idea and am trying to make it! I can’t figure out how to attach the sunflower like flowers. I tried to glue petals, but it’s not working. Any suggestions? Your flowers may be heavy then. You could try trimming the stems to take some weight off or try tying a piece of string or clear fishing line around the base of the sunflower and tie that string to the next flower. Love this! What colour paint is the wall? It’s just a basic white that was in the apartment already. I saw this on Pinterest and I knew I needed this in our new home! So pretty!